Would it surprise you to learn that there was a "national level exercise" in late April and early May that simulated what would happen if a Category 4 hurricane hit the Mid-Atlantic region? As you will see below, this actually happened, and now it looks like we will be facing that precise scenario for real. Authorities are warning that Hurricane Florence could produce a storm surge of somewhere around 20 feet when it makes landfall and dump up to 45 inches of rain on some areas of North Carolina. But of even greater concern is the fact that there are 12 nuclear power reactors directly in the path of this storm. 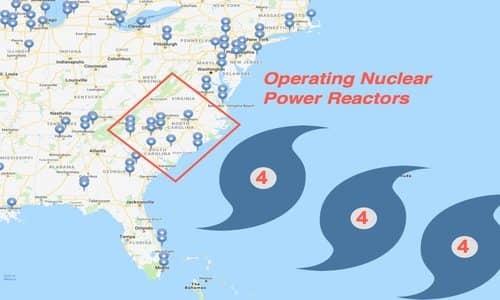 The federal simulation that was held earlier this year concluded that a Category 4 storm could damage a nuclear power plant, and if that happens with this storm we could potentially be facing America's version of the Fukushima disaster. Let's break this down one step at a time. According to the Nuclear Regulatory Commission (NRC), there are twelve operating nuclear power plants in the Carolinas that make electricity by the continuous splitting of uranium atoms (i.e., a nuclear reaction). These plants generally reside near a body of water--a river, lake, estuary or ocean--because they require a constant source of water for cooling purposes. Without cooling water, a nuclear reactor will overheat, leading to core damage, containment failure, and release of harmful radiation into the environment. Flooding from the storm could be catastrophic for the nuclear power plants. Excessive amounts of water can damage equipment or knock out the plants' electrical systems, disabling its cooling mechanisms. This is what happened at the Fukushima Dai-ichi plant in Japan as a result of the March 2011 tsunami, causing severe damage to the plant's reactors. Each unit produces nearly 1,000 MWe of electricity, and they are both built on the General Electric "Type 4" power plant design, which is almost identical to the GE nuclear power plant design used in the Fukushima-Daiichi reactors in Japan. All of these reactors are designed and constructed as "boiling-water reactors" or BWRs. The designs are decades old, and they are subject to catastrophic failures and even core meltdowns that release radioactive isotopes directly into the atmosphere and surrounding areas. The answer is found in the storm surge -- a massive wave of ocean water that swept through the Fukushima facility, drowning the diesel generators, coolant pumps and backup batteries. In effect, Fukushima was inundated with ocean water, and everything stopped functioning. But the physics of the fuel rods was still operating, and you can't stop fission reactions just by hoping and wishing. So the fuel rods melted down and a nuclear meltdown took place, producing the Fukushima catastrophe we're all still suffering under today. But even if all of the nuclear reactors come through okay, this is still an exceedingly dangerous storm and people should be prepared for all possibilities.